A cute dog begging for the Holiday Feast. diabetes, its signs, symptoms and risks can help keep your four-legged family members healthy during the holiday season and in the coming new year. Diabetes occurs when the pancreas does not produce enough insulin so the body can use glucose. Glucose is a type of sugar that comes from the food your pets eat. It is the main source of energy for the cells of your pet’s body. If your pet’s pancreas does not produce insulin, the glucose cannot be used by the body’s cells. What pets may be at risk for developing diabetes? Both dogs and cats can develop diabetes. With friends and family coming together to celebrate Thanksgiving, let’s remember our pets and our guest’s pets. Even if your pet likes new people, an increase in visitors in your home can be frightening and overwhelming. Providing them their own safe place, a kennel or crate, with their favorite toy in a bedroom with a radio or TV playing may be less stressful for your pets. With all of the increased foot traffic during the holidays, the frequent opening and closing of the doors around the home, pets can sneak out unnoticed. Make sure your pet has a current ID tag with a working telephone number on their collar. If your pet is already micro-chipped, please make sure you have registered their microchip number with your most current contact information. Come see us if you would like to have your pet micro-chipped. We know that your dogs and cats are some of your most beloved family members. DO NOT include them in your holiday feast. Giving your pet bones from the turkey or ham can cause severe illness. Bones may cause injury resulting in vomiting, diarrhea, constipation, pancreatitis or GI obstruction, which could require surgery. Eating fatty food, including turkey drippings, butter, gravy or fatty foods can result in pancreatitis. 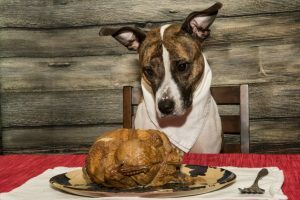 If your pet has been fed table scraps, or helped themselves to your Thanksgiving dinner, watch them closely for the following symptoms; not wanting to eat, vomiting, or diarrhea. These are signs that your pet may have pancreatitis and should be seen immediately. Call the office at (559) 432-0887 if you need assistance.